There are situations in life where our inner voice supersedes outside factors. 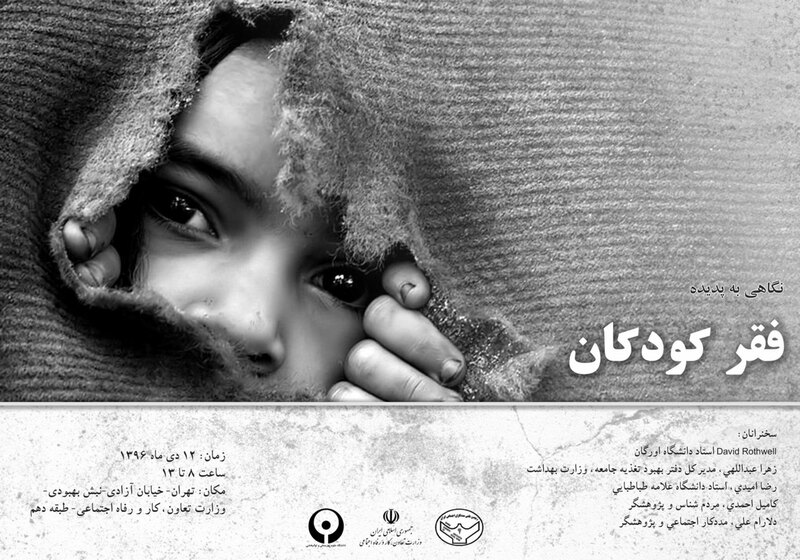 Such was the case on a recent trip CPHHS Assistant Professor David Rothwell took to Tehran, Iran, to present at a symposium “An Examination of Child Poverty” sponsored by the Iran Ministry of Cooperative, Labor and Social Welfare (MCLSW). Unbeknownst to him, the symposium coincided with recent protests – some deadly – throughout the country against the rising cost of food and fuel, and increasing economic inequality. Although Americans can apply for a visa to travel to Iran, the current relationship is strained, and the U.S. Department of State recently issued its highest travel advisory level “do not travel” alert for Iran. The original purpose of the trip was to visit family for the holidays. His wife, Tala Navab-Daneshmand, also an Oregon State professor, is originally from Tehran, and her family still resides there. However, when David was at the International Society for Child Indicators (ISCI) conference in Montreal last year, he met Professor Masoomeh Maarefvand of Tehran’s University of Social Welfare and Rehabilitation. When Masoomeh learned that David would be in Tehran, she invited him to be the keynote speaker at the symposium organized and hosted by the Deputy Minister. Later that same day, he received another call. The MCLSW had obtained a special permit from the Ministry of Foreign Affairs, giving him official permission to participate. Still rattled from the morning call, he talked it over with his family, who advised against it. But something was tugging at him, and he kept thinking of the students. Despite his nerves and his family’s concerns, David entered the Ministry of Labour and Social Affairs building on Azadi Street in Tehran the morning of January 2 ­­– people told him he was probably the first American to ever do so. Once at the symposium, he gave two presentations that focused on child poverty from an American perspective – “Child Poverty Risk in Different Family Structures” and “Asset Poverty Among Children: A Cross-National Study of Poverty Risk” to about 60 MCLSW officials, representatives from the Ministry of Health, researchers, policymakers, social workers and child protection experts. Other speakers talked about food insecurity, early marriage and anti-poverty policies. Presentations were translated live between Farsi and English and vice versa, alleviating language barriers. In the time spent at the Ministry, David solidified plans to collaborate with Masoomeh on future child poverty research. He says that although he has reservations about the political relationship between the United States and the Islamic Republic of Iran, he plans to collaborate on an abstract for the next ISCI conference because studying the condition of child poverty in other contexts provides insight into the nature of child poverty at home.